Unless you don't mind running out to the green bin every time you peel a banana, blow your nose, or make a cup of tea, you'll need to find a way to collect compostable items in your home until you're ready to take them out. 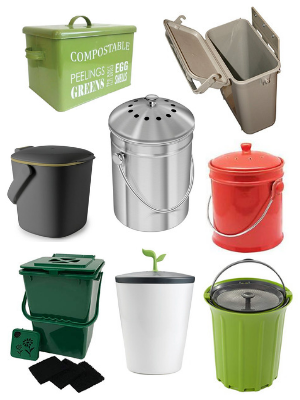 We like to refer to these compost collection containers as "mini-bins." Note: West Hants does not allow disposal of any plastic compost bags in the green cart, as they present several issues for collectors, compost facility workers, and those who buy and use the end product. THIS INCLUDES bags labelled "biodegradable." We understand this may be an inconvenience to some residents, so we ask for your understanding and cooperation. To give you a better composting experience, we've provided multiple alternatives to using plastic catchment bags, along with other tips and tricks for maintaining a clean, odourless mini-bin! What can I use as a Mini-Bin? 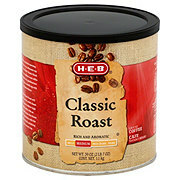 Make use of a large, resealable container you already have. Better yet - reuse a container that can't be recycled and is destined for the landfill anyway - such as a large coffee canister. These canisters, usually holding products such as nuts, coffee, hot chocolate and other drink mixes, are made of multiple/mixed materials (paper tube, foil lining, metal bottom) that cannot be easily separated for recycling. This makes the container as a whole non-recyclable to waste facilities, but perfect for up-cycling into something new at home. Pro tip: Prevent and trap odours by creating a few ventilation holes in the lid of your mini-bin, and use a glue gun to line it with a carbon filter. For a simple tutorial, click here. You can purchase a compost collection container at almost any home improvement store, online, and even some grocery and dollar stores. There are bins on the market specifically made for collecting compost, which will generally come equipped with odour control features and other handy components. Size: Bins generally range from 3 to 5 litres in carrying capacity. 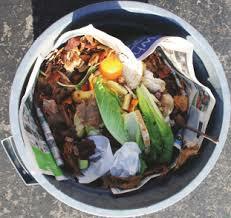 An overly large bin is rarely necessary, as you'll want to empty its contents regularly to keep smells to a minimum. Go for a bin that will fit two to three days worth of compost, whatever that may be for you. Unless you're tight on space, it's best to avoid a narrow bin designs as well, as they can be harder to line and clean. Location: It's important to place your mini-bin in a convenient, accessible location that works for you. There are bins designed for storage under your kitchen sink, on the counter, as a free-standing bin, and even for storing in your freezer! Odour Control: If you empty your bin less frequently or eat a lot of stinky food, you'll want to consider a design with odour control features. Many bins these days are designed with small ventilation holes in the lid and lined with a carbon filter to naturally absorb and trap smells. These filters can last 6 months or more, and if your bin doesn't come with replacement filters (which many do), they can be purchased at an affordable price. Stainless Steel or Carbon Steel: These are extra strong, durable materials that don't absorb unpleasant smells and are very easy to keep clean. They also make for an attractive mini-bin to place on your countertop for easy access. Ceramic: Although they are less durable, ceramic will resist stains and odours like the stainless/carbon steel bins. There are many sleek, contemporary designs available, suitable for almost any kitchen. Plastic: There are many functional and affordable plastic bin designs on the market. The downside: this material tends to absorb smells and stain over time if it's not kept clean. Due to West Hants restricting the disposal of plastic compost bags in the green cart, maintaining a clean, odourless bin may require a bit more work. Natural Fibres: Compostable collection containers are available to buy, which residents can place directly into their green cart when it's full. A popular brand that can be purchased locally is Greenlid, where bins are made (in Canada) from locally recycled cardboard. For things like soups or sauces, use a strainer to drain off liquids. Your green cart is only meant for "solid" compostable material. Use something absorbent to wrap bundles of wet compostables, then place in your mini-bin or directly into your green cart. You can use materials such as gently used napkins and paper towel, newspaper, flyers, sugar bags, flour bags, or boxboard (i.e. cereal or snack boxes). Simply take a few pieces of paper and place them at the bottom and along the sides of your mini-bin. If you're placing wet compostables loose in your bin, you'll want a slightly thicker layer at the bottom where liquids can collect; allow the paper to overlap at the base or add another small piece to cover this area. Alternatively, you can create a bin liner with more structure using this fun and functional pdf origami newspaper bin liner template (125 KB) . Note: Although paper is perfectly suitable for the compost, it is actually more sustainable to recycle most paper products, including clean, dry newspaper, flyers and boxboard. Recycling your paper reduces the need for harvesting new trees, and manufacturing products from recycled material will consume less energy and water than using virgin materials. With this in mind, we ask that you recycle all clean, dry, recyclable paper when it's not being used for your green bin. Alternatively, you can use paper products that are non-recyclable, but still compostable. This includes soiled paper such as cardboard takeout and pizza boxes, which you can cut and fold as needed, napkins and paper towel, or the paper bags sugar and flour generally come in. 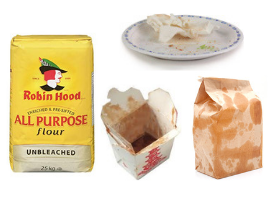 These sugar and flour bags, for example, can be placed directly inside the mini-bin as a liner, or used to collect bundles of wet items. If you're interested in buying leak-resistant, odour proof bags to line your mini-bin, you can purchase the brand Bag to Earth Inc. Its cellulose liner is different from bioplastic compost bags commonly used by other Municipalities. It may look like plastic, but cellulose is merely transparent paper, made from a natural material found in the cell wall of plants. This means the bag will 100% naturally decompose, while actually helping the composting process by adding much needed nutrients. Do you have any plastic grocery bags laying around? What about other soft plastic such as bread bags? Where this material has little recycling value, reusing plastic bags to store compost is a fine way to extend their lifespan. Once you're ready to bring your compost outside, empty the bag into your green bin, and bring it back inside for reuse or disposal. If the bag is fairly clean, give it a little rinse if you'd like, and reuse it. If you would like to recycle it, ensure it is rinsed and dry, as markets have become much pickier with "contaminated" products. If the landfill is its destination, tie the bag into multiple knots before placing it into your garbage. This simple action reduces the number of bags sent airborne by the wind into the surrounding environment! Depending on your bin and what materials are placed into it, you may find that emptying your bin more regularly will be beneficial. If emptying your mini-bin every day isn't feasible, try taking it out every couple days and stop the odours before they start! It's important to keep the insides free of any accumulating gunk by rinsing your mini-bin regularly with water, or a combination of water and vinegar for a deeper clean. Then you can either let it air dry up-side-down in the kitchen sink, or wipe it down with a rag or a gently used paper towel or napkin. Some people like to sprinkle baking soda into their mini-bin afterwards for additional moisture absorption and odour control. Or... Store Compostables in your Freezer! If you're looking for an easy, low-maintenence alternative, this is an excellent spot to collect your compostables. Freezing slows the decomposition process and prevents odour, while also containing a lot of mess. To hold the compost, you can either buy a compost container specifically made for the freezer (like this one! ), or reuse something disposable you already have, such as a bread bag, used zip-lock bag, ice cream tub or food container. (To avoid rejection, please ensure whatever you use to collect compost is sorted into its proper waste stream when no longer in use!) Another great re-use idea: if you have an extra one laying around, try using a silicone loaf pan. It fits conveniently in the door of your freezer for easy access!